In addition to floods, droughts are one of the most damaging natural hazards in human, environmental and economic terms. 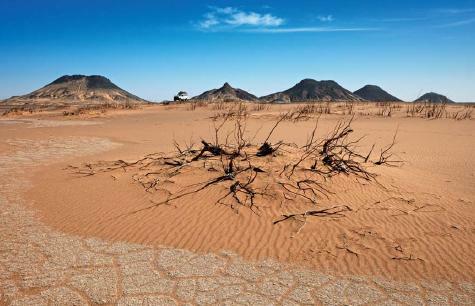 Climate change is stimulating demand from decision-makers and other stakeholders for better understanding of potential future drought characteristics, in order to identify effective measures to reduce drought risks and the associated impacts. Our incomplete understanding of the behavior of the climate system has led to the development of various emission scenarios and climate models. Uncertainties arise also from the different types and definitions of drought. Rita Yu seeks to examine the effects of climate change on European drought, and to illustrate the robustness of these projections by quantifying the effects of using different emission scenarios, GCMs and drought definitions, specifically meteorological and hydrological droughts." As climate changes, an increase in frequency and/or intensity of extreme weather events can seriously impact on lives and livelihoods. Better estimates of potential future extreme weather are therefore essential for national and international policy makers, businesses, and particularly the insurance industry. My research focuses on the development of improved projections of heatwave and intense precipitation events, with a particular focus on droughts, in various world regions for a range of 21st century future climate change scenarios, and to understand the robustness of these projections to use of varying methodologies. If greenhouse gas (GHG) emissions are not reduced significantly, Europe, particularly the Mediterranean countries, could face enormous increases in droughts by 2100. Spain, Italy, Croatia or Greece, for instance, may face year-long, or even multi-year, drying. But the good news is that climate mitigation policies (i.e. reducing human emissions) have the potential to dramatically lower that risk. However, they will have to be drastic. Stabilizing CO2 concentrations at 400-450 ppm (or parts per million, the common measurement unit in dry air), a stringent goal, would be necessary. Even then, profound increases in drought may still occur. These initial findings were presented at the International Scientific Congress on Climate Change in Copenhagen, in March 2009, by Rita Yu and three colleagues (1). She is now pursuing her PhD at the Tyndall Centre for Climate Change Research at the University of East Anglia. Her present research, which builds on the European results of her Master’s dissertation, aims to develop improved projections of heatwaves or intense rainfall, with a particular focus on droughts for China in the 21st Century. “Before, scientists used to study mean climate change”, Yu says. “But knowing more about future changes in extreme weather events is crucial to decision makers, who can then anticipate and develop adaptation strategies accordingly.” Rita is eager to refine these simulations and examine the associated uncertainties in order to make them more relevant for both public and private planners. To do so, she will explore a range of GHG emission scenarios, climate models (mathematical models used to study climate evolutions) and different definitions of extremes, using Tyndall Centre’s Community Integrated Assessment System (CIAS). “The outcome will be important for water resource managers, for example. But I also hope this will provide an incentive for large scale mitigation efforts”, adds Yu. Total number of months affected by drought during 2050-98, under unmitigated and mitigated climate change. From (1)“Future European Drought Regimes under Mitigated and Unmitigated climate change: application of the Community Integrated Assessment Model”, by Warren, R., R.M.S. Yu, T.J. Osborn, and S. de la Nava Santos (under review).